McKee's 37 Marine & RV Hydro Pearl Sio2 Coating is the ideal way to coat your RV or boat with glossy protection that lasts month after month. This innovative formula features the ultra-easy spray-on, rinse-off simplicity you need when coating a large RV or boat. 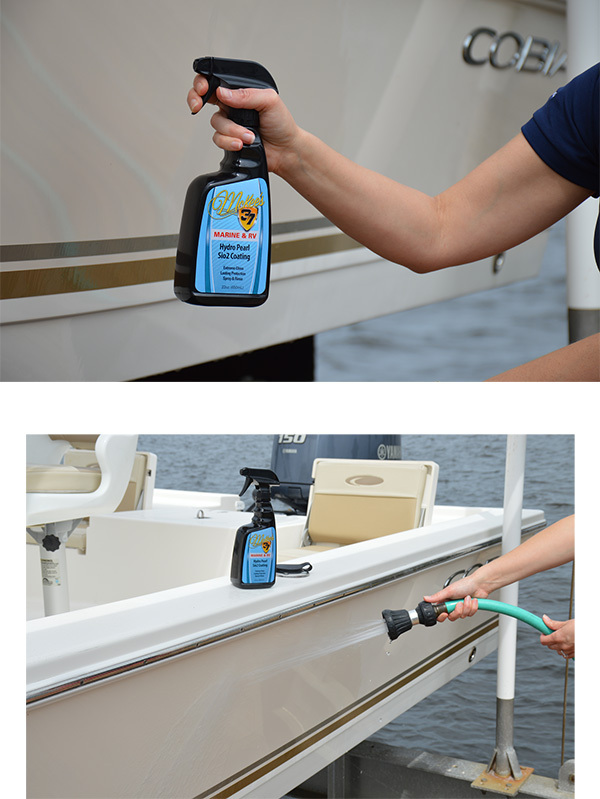 McKee's 37 Marine & RV Hydro Pearl Sio2 Coating simplifies your maintenance routine without compromising on the level of protection, gloss, or water beading you'll achieve! When you've got a boat or RV you want to be using it not fussing with maintenance! The size of most RVs and boats is enough to drive some people to ignore waxing or sealing completely. So what's a boat or RV owner to do when they want protection and gloss, but don't want to take time out of their vacation to do ti? Coat it with McKee's 37 Marine & RV Hydro Pearl Sio2 Coating of course! McKee's 37 Marine & RV Hydro Pearl Sio2 Coating creates incredible gloss and unmatched water beading with minimal effort. It truly is as simple as spraying onto the surface and rinsing it away with a strong jet of water. You can “wax” your boat or RV and still have time to enjoy it! You'll also love the fact that McKee's 37 Marine & RV Hydro Pearl Sio2 Coating keeps surfaces cleaner between washes thanks to its extreme hydrophobic properties — a quick rinse will remove most dirt and grime! Spray and rinse paint coating for your boat and RV! 2. Apply AFTER you wash your boat or RV, while the surface is still wet. 3. Working on an area no larger than 10' x 10', spray Hydro Pearl directly onto the surface. 4. IMMEDIATELY rinse off using a strong jet of water. Note: Apply to all hard, smooth surfaces (paint, gel coat, glass, metal). Do not use on underfoot surfaces. McKee's 37 Marine & RV Mildew RemoverMcKee’s 37 Marine & RV Mildew Protectant SprayMcKee’s 37 Marine & RV Water-Resistant Vinyl ProtectantMcKee’s 37 Marine & RV Gloss Enhancing Final PolishMcKee's 37 Marine & RV Final Step Detail WaxMcKee's 37 Marine & RV All-In-One Fabric & Vinyl CleanerMcKee's 37 Marine & RV Carnauba Wash & WaxMcKee’s 37 Marine & RV Heavy Duty Cleaner WaxMcKee’s 37 Marine & RV Repel Glass & Plastic CleanerMcKee’s 37 Marine & RV All Purpose Surface CleanerMcKee’s 37 Marine & RV Bug Remover & Wax RestorerMcKee’s 37 Marine & RV Vinyl Decal & Graphic RestorerMcKee’s 37 Marine & RV Heavy Cut Oxidation RemoverMcKee’s 37 Marine & RV Carnauba Sealant WaxMcKee’s 37 Marine & RV One-Step Polish & SealantMcKee’s 37 Marine & RV Repel Glass & Plastic Cleaner 128 oz.McKee's 37 Marine & RV Final Step Detail Wax 128 oz.McKee's 37 Marine & RV Carnauba Wash & Wax 128 oz.McKee's 37 Marine & RV All Purpose Surface CleanerMcKee’s 37 Marine & RV Bug Remover & Wax Restorer 128 oz.